By Sia in Internet. August 31, 2017 . Cloud storage services have gotten rather handy in recent times. The ability to save your files to the cloud and retrieve them anywhere and at anytime gives users a degree of flexibility that was considered impossible years ago. We begin this article with Google’s own cloud storage service – Google Drive. As one can expect from Google Drive, this particular cloud storage service is heavily integrated into Google’s ecosystem. Because of that, if you’re an Android user and/or a Chrome OS user, this cloud storage service will be your main choice. When it comes to the browser experience, Google Drive has one of the finest user experience when compared to all the other options mentioned in this article. You can get so many features in Google Drive only if you know a few tricks to get the most out of it. Do you need to upload a bunch of files in a hurry? Simply drag and drop all of them into the browser. Need to retrieve some files? All you need to do is highlight the files you need, click the right mouse button, and select the "Download" option. All of the highlighted files would then be downloaded to your computer. Not a fan of digging through the browser side of Google Drive? If you like your cloud storage service accessible via a desktop application, the new Backup and Sync tool will be just what you need. With this application installed, you’ll be able to create new folders, or mark pre-existing folders on your computer to automatically sync with Google Drive. When it comes to free storage space, the service offers users 15 GB of storage space right from the get go. Anyone who signs up for a new Google account will get 15 GB of Drive space with absolutely no need to jump through any hoops. If you need additional space, you can always subscribe to a premium plan. The cheapest premium plan gets you 100GB of storage space, while the most expensive plan will grant you 30 TB of space for a monthly fee. 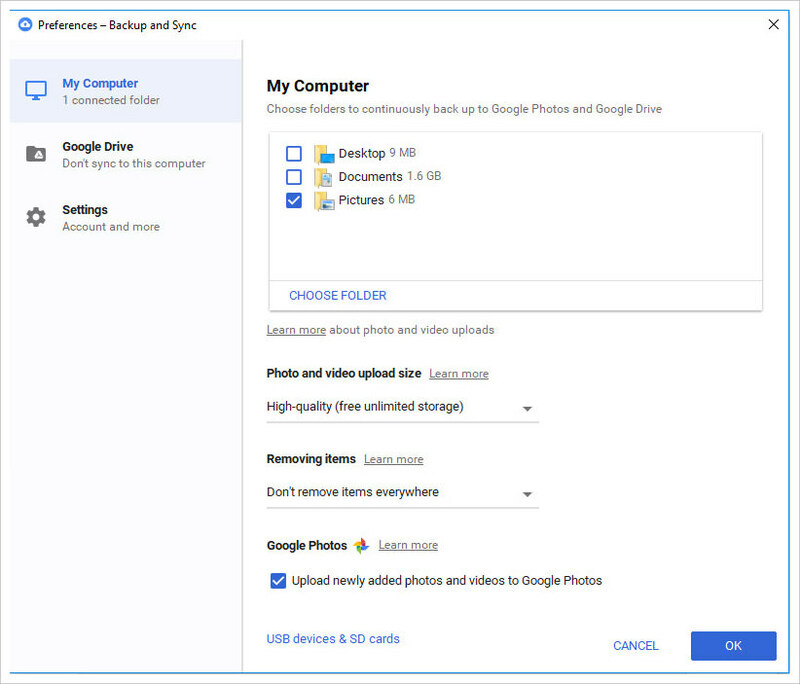 Because of the way Google Drive is integrated into Google’s ecosystem, the cloud storage service is able to tap into Google’s other services such as Google Photos, Docs, Sheets, Slides and even Play Music with little to no issues. 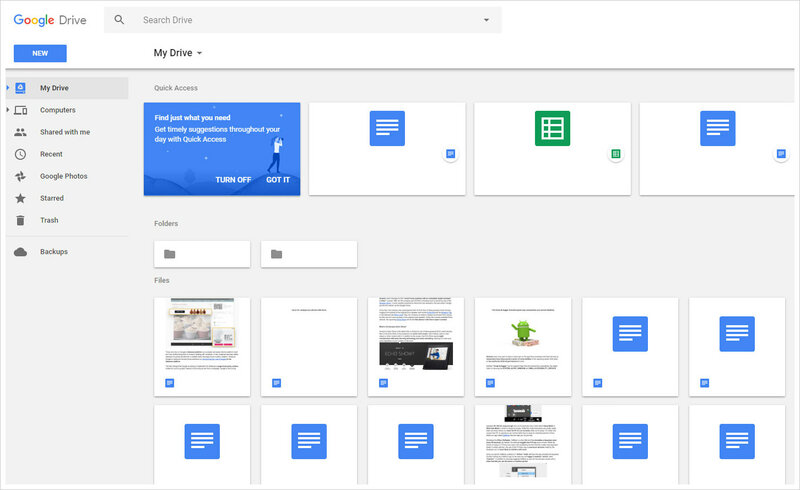 Simply put, if you’re heavily reliant on Google’s suite of services, Google Drive is very much your de facto cloud storage service of choice. 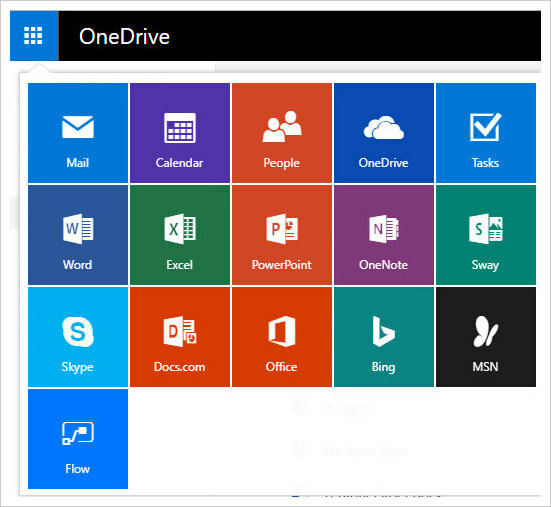 Next up on the list for this article is Microsoft’s offering – OneDrive. Much like Google Drive, OneDrive is yet another cloud storage service that focuses on its ecosystem. As such, this particular service would be ideal for those who are Microsoft-centric. Setting up OneDrive is probably the easiest thing to do if you own Windows 10. Why is that, you ask? Well, that’s because the cloud storage service is pre-installed onto every copy of Microsoft’s latest operating system. Simply put, if you’re currently running Windows 10, you would already have a OneDrive account available for use. If you’re not a Windows 10 user, you’ll just have to sign up for an account with Microsoft. Usability-wise, OneDrive does almost everything Google Drive is capable of. It has access to the Microsoft Office suite, it has integrated syncing, etc. Unfortunately, the OneDrive experience as a whole feels less polished than what Google has at the moment as the browser experience feels less intuitive than Google Drive’s. While OneDrive offers some really cool functionalities (like the recently launched ‘Files on Demand’ feature etc. ), the user experience does leave much to be desired. Microsoft used to offer 15 GB of free storage space if a user were to sign up for OneDrive. Unfortunately, that is no longer the case. New OneDrive users will only receive 5GB of free storage space on sign up. The good news is that users can expand their free OneDrive storage space to 15 GB. However, doing so requires users to use the referral system. As each referral increases your storage capacity by 0.5 GB, netting the 10 GB space increase means that you’ll need to refer OneDrive to 20 of your friends and family. If you’re not a fan of annoying people you know, this system wouldn’t amuse you in the slightest bit. As with any other cloud storage service, OneDrive does have its premium offerings, but unlike the premium plans that other cloud storage services offer, OneDrive’s offerings are quite unique. 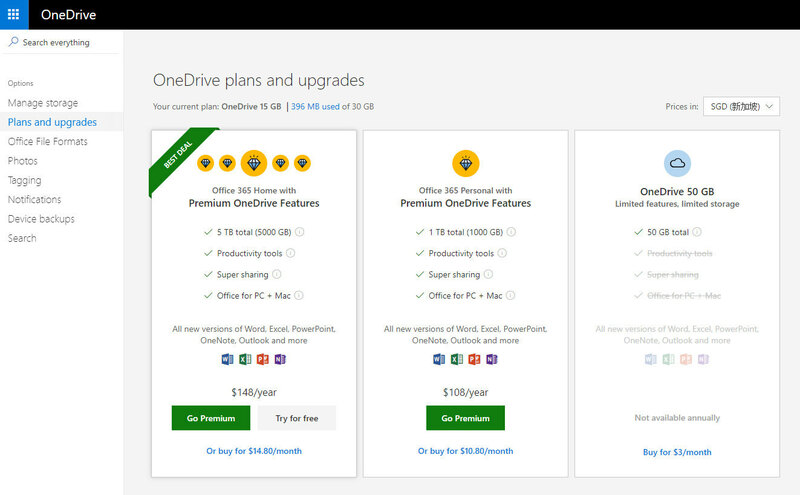 The most basic subscription tier will give users 50GB of storage space for OneDrive. If you’re willing to subscribe to OneDrive though, you really should opt for the 1 TB tier as it will grant you full access to Microsoft’s Office 365 suite alongside the storage expansion. If you’re a heavy user of Word, Excel or Powerpoint, this particular subscription tier is quite the offer. 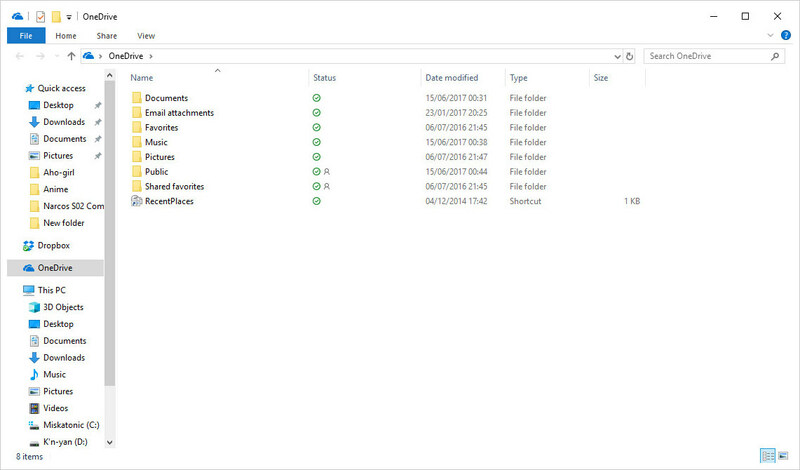 As mentioned earlier, OneDrive is integrated directly into Windows, so those who operate on the Windows ecosystem can navigate OneDrive without much problem. Seeing as Microsoft’s Office suite is also offered on iOS and Android platforms, iOS and Android-centric users may also find a use for OneDrive. However, OneDrive on iOS and Android would most likely be relegated as a backup option as it makes more sense for iOS and Android users to opt for iCloud Drive or Google Drive instead. Dropbox has the honor of being the oldest among all major cloud storage services. Unlike Google Drive, Microsoft OneDrive, or even Apple iCloud, Dropbox is more of a standalone service than an ecosystem-focused one. As such, the service lacks some of the functionality that the others have. On the other hand, not being tied down to an ecosystem also means that Dropbox is far more flexible than the other offerings. With Dropbox being as old as it is, the service has introduced a ton of features over the course of the years. It lets you upload and sync your files either through the web or through the client. It also has features such as file recovery and version history, making it easier for you to track your files. Most importantly, sharing and syncing folders with Dropbox is extremely handy thanks to the myriad of ways to do so, as well as the additional settings that come with it. That isn’t to say that Dropbox is the best cloud storage service out there of course. With the amount of features and improvements that have been made to Drive, OneDrive and iCloud, there are certain aspects of Dropbox that feel outdated in comparison. For starters, Dropbox isn’t exactly great at file management, something that becomes extremely obvious when it comes to photos. Additionally, Dropbox lacks a proper office suite. 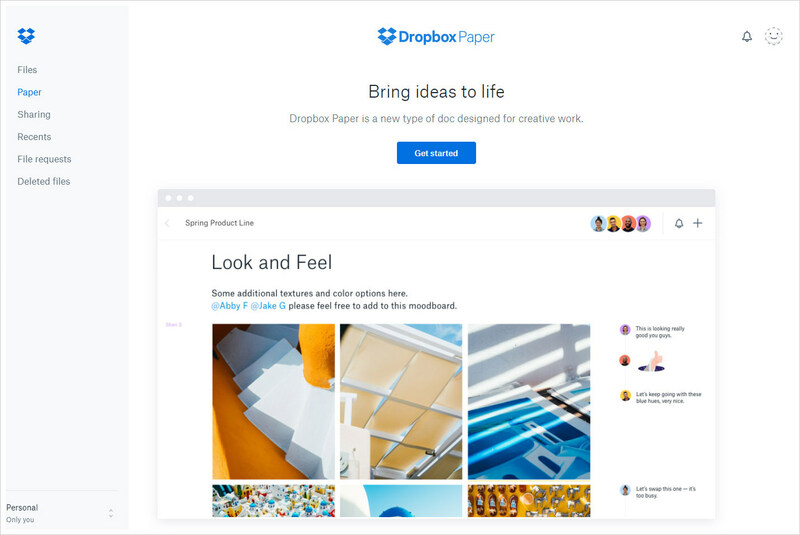 While Dropbox Paper is sufficient for simple editing purposes, the suite lacks the capabilities that Google, Microsoft and Apple’s online office suites have such as a proper Powerpoint or Excel alternative. When you first sign up for a free Dropbox account, you’ll notice that the service provides you with a pitiful 2 GB of storage space. The good news is that the free storage space can be expanded to a maximum of 16 GB, which is actually more space than what Drive, OneDrive or iCloud provides you with. The bad news? You’ll need to send at least 32 referrals to your friends and family in order to max out your free storage space. However, there are other ways to increase Dropbox storage space as well, you can check those here. 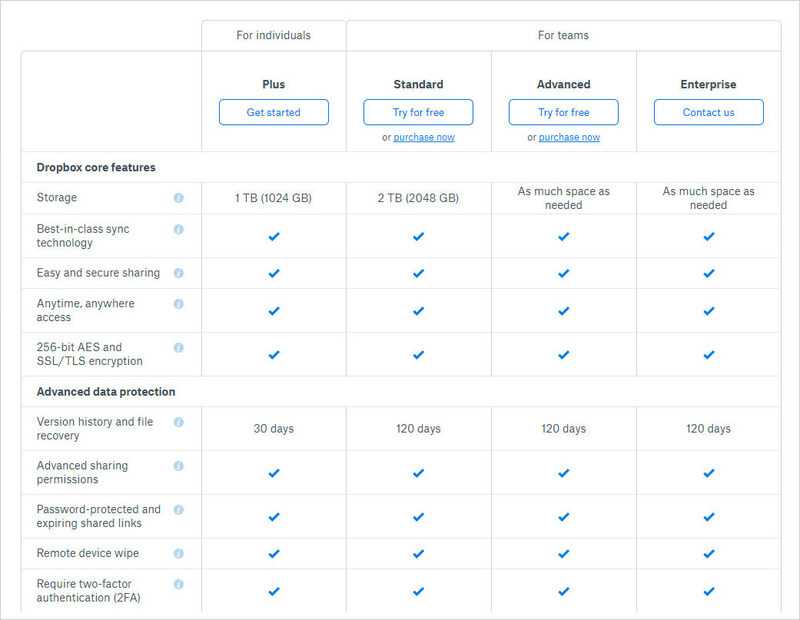 As for the premium side of things, Dropbox comes with a number of plans that provide the user with varying amounts of storage space. 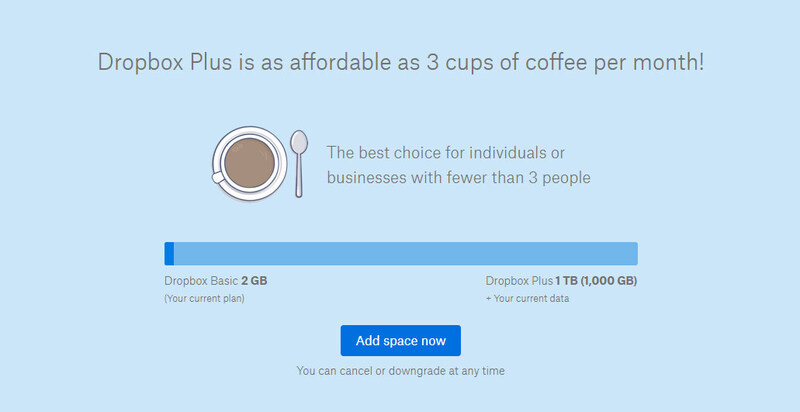 The most affordable of the bunch is Dropbox Plus, a single-user plan that provides you with 1 TB of storage space. As Dropbox is a standalone cloud storage service, it lacks the kind of ecosystem integration that the other services in this article has. However, what it lacks in integration, it makes up for in availability. 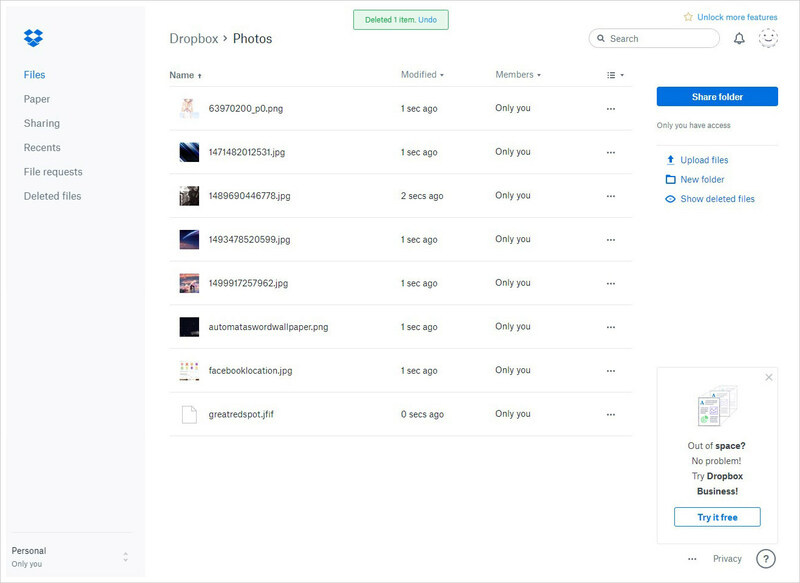 Dropbox is available across a large number of platforms, ranging from Windows to Linux, meaning that you’ll be able to use it across more machines than its competitors. While it is certainly not the most sophisticated of services, it is definitely one of the more widely available options. Rounding up the list of cloud storage services, we’ve come to Apple’s own offering – iCloud Drive. Considered by many to be a weak service years ago, Apple has since been improving the service to make it much more user-friendly. The end result? iCloud Drive is now a better service as a whole, even though the service is still rather lackluster in certain departments. Getting iCloud Drive up and running is rather straightforward if you’re on a device that runs on either iOS or macOS as the service is available right out of the box. Setting up iCloud Drive is simply a matter of enabling iCloud on your Apple device of choice and activating the feature. Once done, your files can then be automatically synced to the cloud service. If you’re on a non-Apple device, iCloud Drive will only work on Windows-powered machines. Assuming you own a Windows machine, you’ll need to download the client and install it. Once that’s done, you’ll just need to login to your iCloud account, designate the items that you wish to sync with iCloud Drive, and just like that, the storage service is ready to go. While much of iCloud Drive’s offerings are good, free storage space remains the one part of the service that can only be described as disappointing. 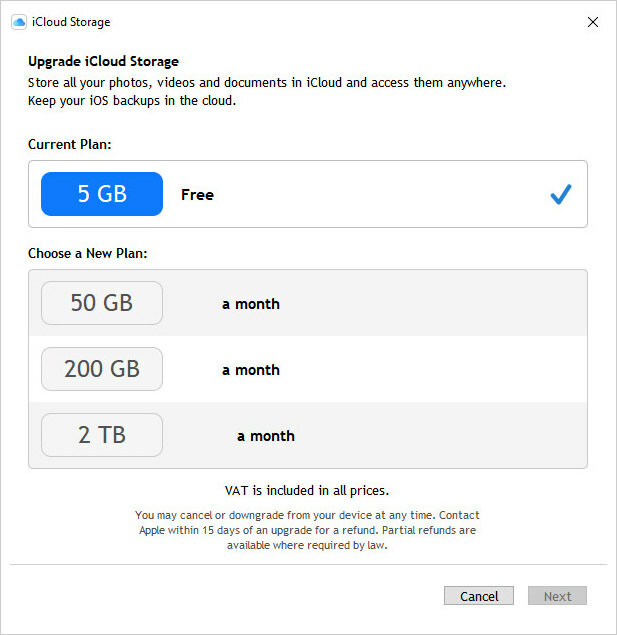 Where all services on this list lets you have at least 15 GB of free storage space, even if you have to work for the extra space, iCloud Drive only provides you with 5 GB of free storage. Want extra storage space? 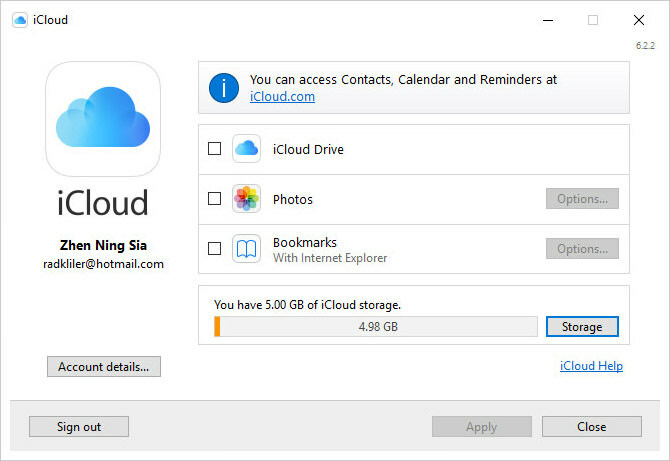 Apple lets you expand your iCloud Drive space to 50 GB, 200 GB or 2 TB. All in all, the storage upgrades aren’t exactly what I would call flexible when compared to the other options available. Apple has always been known for providing services that work together well with their ecosystem, and iCloud Drive is no different. If you’re heavily reliant on macOS and/or iOS, iCloud Drive would be the logical cloud storage service to opt for as it works right out of the box, and the user experience is very smooth. Things are a tad bit different if you juggle multiple ecosystems of course. If you’re a Windows user, iCloud Drive is an option available for you, although it may not be your first choice of service. However, if you’re an Android user, iCloud Drive is straight up not an option for you as the service isn’t available there. Too much information? I feel you. Here are some tabulated data for you to digest some of the information you care about. Comparison of free storage spaces and how much more you can earn by referring them to your friends. ErrorYou are trying to load a table of an unknown type. Probably you did not activate the addon which is required to use this table type. If you’re looking to pay to get more storage spaces, here’s how much you’re going to pay compared to what you’re getting. A look into the operating systems and platforms each cloud storage service supports. At the end of the day, choosing a cloud storage is completely dependant on your needs and preferences. If you’re someone who has heavily invested in an ecosystem, then iCloud Drive, OneDrive or Google Drive will be your ideal choice. On the other hand, for someone who works across multiple systems, Dropbox would be the better option. Overall though, I would say that Dropbox is the better option for those who just wants a simple, no-frills cloud storage for their files. However, if you need the bells and whistles alongside your cloud storage, then Google Drive is the service to go for.